Ever sent a PDF over to a publication or a printer, only to have it rejected for a variety of obscure reasons? The pre-press gurus of Adsend say that at the very least, you should be checking for these eight basic things when you are exporting your artwork to PDF. How many of these do you currently check for? Check 1: Do you know what specifications you are working to? First of all, make sure to double-check the basics like the dimensions of the file required. Knowing the specifications that you are working towards will be critical for some of the other checks in this list, like the one for ink weight. So for more detailed specifications, you should check the publication’s media kit. Some publications also have a portal for material submissions which may contain further information on the required print specs. Printers will also have pages which provide all the details you need to ensure your file is optimized for their printing process. Check 2: Do you need to use a special ICC profile? While most publications and printers use industry-standard ICC profiles (e.g. : ISONewspaper26v4 for Australian Newsprint and 3DAP for Australian Magazines), others require you to embed a special ICC profile into your PDF. (For more information about ICC profiles, the standards used in various countries, etc, check out our post “Advertising Artworker’s Easy Guide to Color Profiles.”) Check their instructions to clarify what is needed. Most of the time, you can download these ICC profiles with the media kit. Or you can email the publication and get them to send the files over. If you are using Adsend, you can bypass all that research work by downloading the correct ICC color profile from directly within the system. Go to the Create Job tab. Enter the name of the publication you are sending to. Then, to the right of the section, click on the Section Specification link. At the bottom of this overlay, you will find a link to download the correct ICC color profile. Check 3: Is the appropriate ICC profile embedded? You might have downloaded and installed the appropriate ICC color profiles, but the PDFs you send over need to actually be using the required ICC profile. Open your PDF in Adobe Acrobat Professional. Open the Convert Colors dialog box by choosing Tools, Print Production, Convert Colors. Look for the section called Output Intent. Open the file in Acrobat Professional. Select Print Production under the Advanced dropdown menu, then click on Convert Colours. Under output intent, select the corresponding 3DAP Profile. Beneath, tick preserve black and preserve CMYK primaries Then OK. Check 4: Have you converted all Spot or RGB colors into CMYK? This check needs to be done in InDesign before exporting to PDF. The good news is that it is easily fixed. You can check if your artwork has Spot or RGB colors by looking for the Swatches panel in InDesign or Illustrator. The Swatches panel lists all the colors used in your artwork. Find for swatches that are set to spot colour: these are marked by a spot in a box next to the swatch. If you open the Ink Manager from the Swatches panel menu, it will actually list by name the different inks being used in the document. If the Ink Manager contains anything other than Process Cyan, Process Magenta, Process Yellow and Process Black, then there is a problem. If you find any non-process swatches, double-click on them, and choose Process from the drop-down menu, then click CMYK. Alternatively, in the Ink Manager dialogue box, you can check the option All Spots to Process, then click OK. Check 5: Are all your elements in high res? Everyone knows we need high-resolution photos in the artwork, so it will print out sharp and with no pixilation or compression artefacts. But photos aren’t all that you have to worry about. In some cases, problems with vectors and transparencies can throw up errors when publishers and printers are checking files for press-readiness. Start the export process from Adobe InDesign as per normal. Click on the Advanced panel of the Export Adobe PDF dialogue box. Set the Transparency Flattener to use the High Resolution preset. Continue with the rest of the export process. If you are an Adsend user, and the system has rejected your file because of element resolution issues, you can diagnose the exact areas of concerns by downloading and checking your Advanced file report. The report indicates visually the problem areas so you know exactly where to look. Check 6: Are your bounding boxes in place? To be press-ready, your artwork should contain the correct bounding boxes, which indicate the trim, document size, and bleed size. The artwork was saved as an EPS and dropped into Distiller. The artwork was exported from Illustrator/InDesign, without the bleed added into the document setup. The artwork was created in Photoshop, which does not have to ability to create these bounding boxes. Without these bounding boxes, pre-press systems cannot measure your file dimensions. So be sure to set up your bleed, trim and dimensions properly when you create a new document in InDesign – or use the options under File > Document Setup to modify those settings. 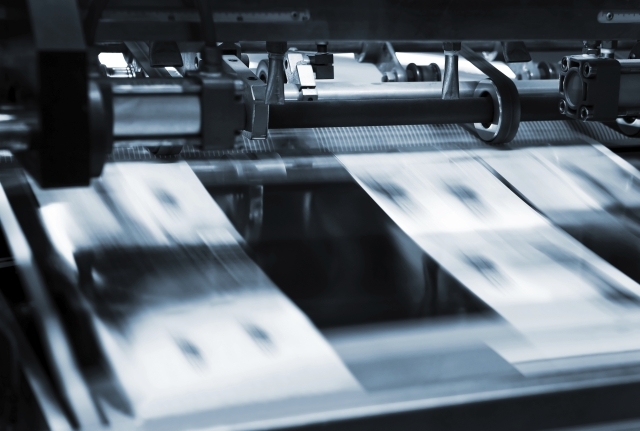 Check 7: Is your Ink-Weight at the correct levels for your publication? It can be easy to forget that printing is an analogue process, involving the laying of ink on paper! If your artwork causes too much ink to be laid down in particular areas, it could cause printing problems. Delays in ink drying could slow down the printing process, or result in smearing or ink transfers onto facing pages. Ink Weight (also known as Total Ink Coverage, Total Area Coverage, Total Ink Density, and Total Ink Limit) concerns the amount of ink being laid down. This is particularly complex with color printing, since there are four different inks piled on top of each other. Each publication/printer will have their own Ink Weight limits. Fairfax Rural Press, for example, has a total ink limit of 230 percent for its newspapers, while certain printers might start ringing the alarm bells at 260 percent total ink. Ensure you have your file open. Click on the Window drop down menu. Select Output, then Separations Preview. Under the drop-down for View in the Separations Preview pane, select Ink Limit to view the ink weight for each color, as well as the total ink weight. Check the ink weight against the specifications of the publication you are sending to. At this point, if your Ink Weight is over the limitations set down by your destination, you can fix any issues by manually adjusting colors. But it will probably be faster to let the export process take care of it – see the upcoming Fixing The Issues section. Check 8: Are you using the correct PDF standard? Consult your publisher/printer’s instructions on the accepted PDF standards. Generally speaking, exporting to PDF/X-1a:2001 will resolve many of the color, font and trapping variables that cause printing problems. The Fixing The Issues section below will show you how to export to this specification. Some of the issues uncovered in the checks above can be solved by setting up the correct settings during Export. For example, using the appropriate ICC profiles will correct any colorspace and ink weight issues you might have. Open your source file in Adobe InDesign. Export the file as an Adobe PDF. In the export window, under Output, ensure that the Color Conversion dropdown is set to Convert to Destination. Select PDF/X-1a:2001 as the standard. Under Output Intent Profile Name, select the correct ICC profile – either the specific ICC profile provided by your destination, or, in Australia, 3DAP for standard magazines and ISONewspaper26v4 for newprint. Do you think we’ve missed anything? Are there some checks that you find to be absolutely crucial? Or do you simply have an automated preflight check take care of all of this? For more information on workflow automation, view our free eBook; How automation can optimise your ad production.